Dance Studio No. 1 is “an R.A.D. school”, meaning the Studio teaches the Royal Academy of Dance (R.A.D.) method as the foundation of its Pre-Professional Ballet Program. R.A.D. curriculum and exams are introduced at Ballet level “Grade 5” and then taught through Ballet level “Advanced 2”. Taught in 85 countries around the world, the R.A.D. 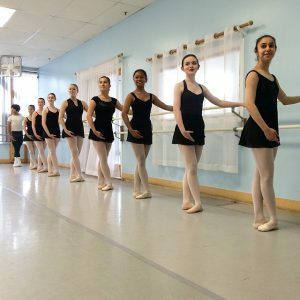 is the world’s leading organization in classical ballet teaching known for its correct and precise technique providing for a safe, age-appropriate, and thorough foundation training in classical ballet. (For more information about the R.A.D., please visit www.rad.org.uk). Students in the Pre-Professional Syllabus Program participate in winter and spring recitals annually. Select dancers in the program have the option to perform at competitions or other community events, such as Youth America Grand Prix. Several students in the program also participate in DS1’s summer International Dance Acclaim Dance Intensive. Placement Classes: All new students entering into the Pre-Professional Syllabus Program will be required to take a placement class in order to determine the appropriate grade level. All students must be of age by December 1st of every school year.